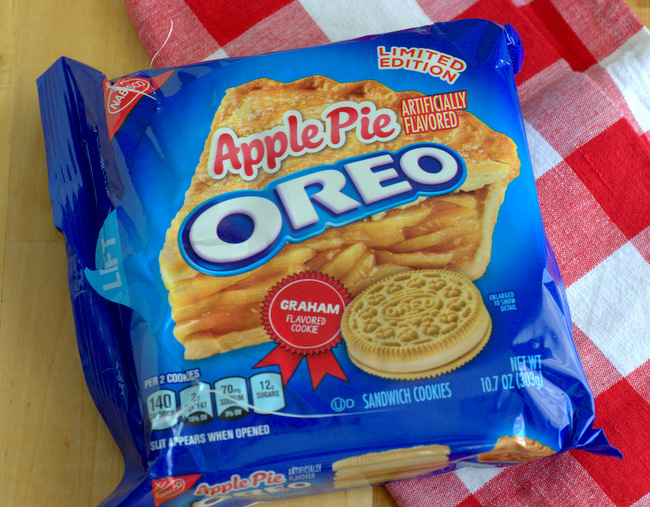 Oreo just launched their newest seasonal flavor and it’s a good one: Apple Pie Oreos. The flavor is the newest in a long line of limited edition Oreos that have featured a wide variety of flavors, from lemon to s’mores. Apple pie is not the first apple flavor that the brand has launched – that would be caramel apple – but it is my favorite so far. 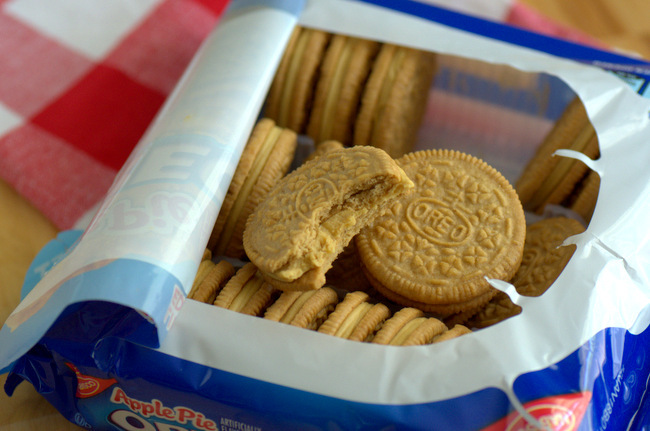 The Apple Pie Oreos are delicious, with an apple flavored creme sandwiched between two graham cracker wafer cookies. The graham-flavored cookies (they do contain graham flour, for anyone who might be wondering) were featured a few times before and make a welcome reappearance here. They have the same texture as the vanilla wafer cookies, with a honey graham flavor that is pretty close to what you would find in a regular graham cracker. They’re pretty tasty on their own and I wouldn’t mind seeing them in more flavors in the future. The graham wafers pair very well with the sweet apple filling, which has a very subtle hint of spice and lots of bright apple flavor. The combination actually reminds me a bit of a streusel-topped apple pie! Like all Oreos, these can be eaten on their own or dunked in a glass of milk. The cookies are sweet, but they actually do capture the flavor of apple pie and are pretty tasty – especially when you don’t have a slice of pie on hand! But eating them as-is isn’t the only way to enjoy them. The cookies can be used to make crusts for cheesecakes and pies, where they’ll bring that graham and apple flavor in for a nice addition to a classic cheesecake or fruit filling. It’s pretty easy to bake with all flavors of Oreos, as the sandwich cookies work well in a variety of bake and no-bake recipes. I thought they tasted like an apple-cinnamon candle.